THE DOMESTIC KITCHEN has come a long way since the caveman’s fire. But the basic ideathat of transforming organic matter into proper food by the controlled application of heatis more or less the same. Within this admittedly narrow definition, the kitchen can be understood not only as an instrument of civilizationcooking food is, after all, an activity unique to humankindbut, more specifically, as a means of regulating various flows, including everything from fuel and air to manage the fire, to seasonal streams of gathered plants or hunted flesh, to the cooking by-products and refuse that must be continuously removed. The entire operation is directed toward guaranteeing another flow, that of the energy needed to keep the human body running. Much of that energy, of course, is subsequently expended in pursuit of organic matter to process into food. It was simple serendipity when the act of making something edible from these intersecting flows of energy and raw food first resulted in something nice to eat. But some fixed part of the human conditionperhaps the gratification that can result from the sheer exercise of our sensessoon redirected our attention from the survival value of food to its sensual appeal. The goal of satisfying taste, and not only sating hunger, has been held in high enough esteem over the years to warrant spaces dedicated to it. For all the ways that the kitchen has changed in the past, it remains essentially a mechanism to turn flows of matter and energy into moments of sensual pleasure. Margarete Schütte-Lihotzky, Frankfurt Kitchen from the Ginnheim-Höhenblick Housing Estate (reconstruction), 1926–27, Frankfurt, 8' 9“ x 12' 10” x 6' 10". As such, the household kitchen has evolved in response to changes in the forms and availability of organic matter and in the types of energy used to transform it into food. With the industrialization of agriculture and with more intensified use of energy, especially electricity, as well as with the specialization of labor that led to commercial production of formerly homemade foods, the distinct functional aspects of domestic food preparation, including acquiring and storing, cutting and chopping, pickling and preserving, cooking and cooling, were increasingly associated with specialized devices, such as the pantry or the iron stove, and hand tools, such as peelers or corers, and, eventually, consolidated into a single space: the modern kitchen. As techniques for rationalizing manufacturing processes extended to all spheres, the kitchen became a conspicuous site for domestic reform efforts. Christine Frederick’s New Housekeeping: Efficiency Studies in Home Management, first published in 1913 and subsequently translated into multiple languages, became a landmark in the effort to align domestic labor with the methods of other work sites and to thereby make food preparation more efficient. Just as machinery and the factory labor needed to operate it came to be regulated by the clock, so, too, were kitchens reconfigured to appease a sharper sense of time. In the modern kitchen, each aspect of food preparation ratchets together the otherwise dissimilar time frames of distinct flows of things. In the pantry, for instance, a variety of products, including baked and canned goods, grains, roots, and spices, all drawn from different parts of local and foreign landscapes, are conjoined under a new and encompassing concept of duration: shelf life. 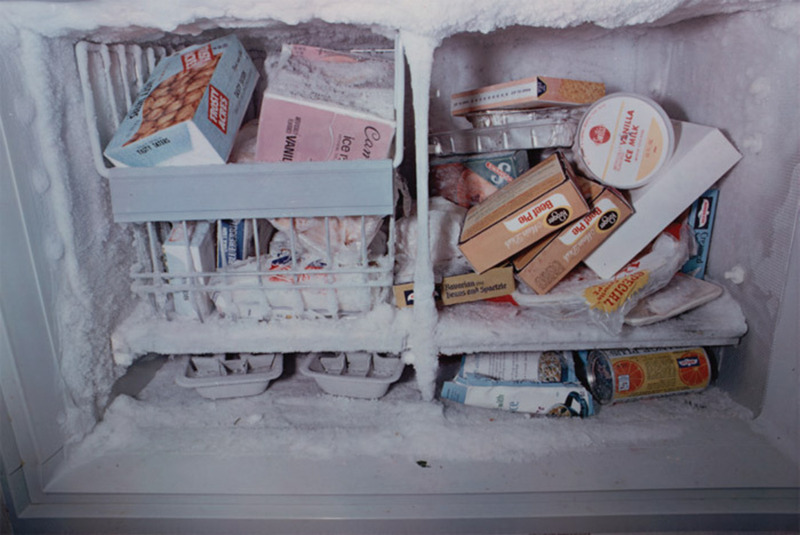 Likewise, seasonal cycles are redistributed within the artificial climate of the refrigerator, where foods from different locales meet foods from different pages of the calendar and blend into a comestible pastorale when the refrigerator door is swung open and the question “What’s for dinner?” is asked. Cooking, too, brings together and recalibrates temporal flows as the chef makes use of a cooktop and oven, hot and cold running water, a refrigerator and freezer, to alter the ingredients’ physical makeup as a stage in the creation of something entirely new. Various signals, such as rising steam, bursting bubbles, and telltale odors, mark the progress of the edible amalgam as it is shepherded closer and closer to the coming moment of consumption. The reinvention of the kitchen as a factory found its perfect expression in Margarete Schütte-Lihotzky’s 1926–27 Frankfurt Kitchen, which serves as the centerpiece of “Counter Space: Design and the Modern Kitchen,” an exhibition organized by Juliet Kinchin and Aidan O’Connor and on view at the Museum of Modern Art in New York through March 14. 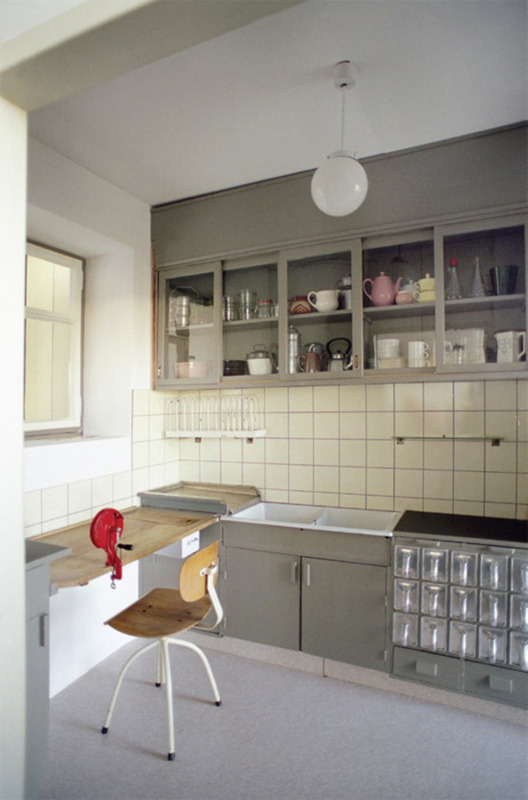 Schütte-Lihotzky designed the kitchen for mass production; it was installed in thousands of apartments as part of a public housing campaign in Frankfurt following World War I. The design is remarkable for making the many flows into and out of the kitchen easily accessible and visually manifest. Cast-aluminum storage drawers and glass-fronted cabinets of varying size hold foodstuffs and cookware merely an arm’s length away from any point along the narrow plan. Furthermore, the drawers can be removed so that their contentsflowing foods such as flour, sugar, potato meal, and graincan be poured, or refilled from sacks stored in cabinets below the work counter. At one remarkably dense corner, a cupboard, a work surface, a waste drawer, a sink, and a drain board, not to mention a fold-down ironing board, all share the same square footage. At the center of this work space is a swivel chair, above which hangs an adjustable ceiling lamp, so that the captain of the kitchenpresumably a woman, the reason that a woman was invited to join the otherwise all-male housing design teamcan be as tightly geared into place as the machinery around her. As wife or mother spun on her stool to manage the foods coming in, the meals going out, and the waste washing away, the kitchen was integrated into the rationalized construction, industrialized methods, modern materials, and emphatically repetitive designs of modern housing. Evolving technologies and instrumental thinking are not the only things that have shaped the kitchen, however. Pleasure, too, is a powerful organizing force, and it changes. Certainly, the kitchen generates oral pleasures such as the warmth, textures, and tastes of various dishes, as well as their combination and sequence in that higher-order construction, the meal, all of which are underpinned at every point by smell. But pleasure is also primed by visual and even intellectual means. At first glance, the Frankfurt Kitchen’s meticulous design appears to have blanched all possibilities for pleasure by creating a stripped-down, regulated work space organized to dominate a woman’s attention as she dispatches her daily chores. Look again: Not only love of design is evident here but an outspoken delight in visual organization, a syncopated synchrony of surface and pattern. Whatever it is like to work in such a kitchen, the design is a joy to behold, a celebration of exquisite restraint, of the pleasure of refining the final increment of material flows of foodstuffs that extend from the kitchen all the way back to distant farms and ranches. William Eggleston, Untitled, 1972, color photograph, 11 1/2 x 17 3/8". With the kitchen so explicitly a site of the artificial, it is no surprise to find there a fetish for tools, a fixation that only expanded when ramped-up wartime production turned toward domestic ends in the years following World War II. Accordingly, “Counter Space” highlights a number of innovative kitchen implements, cleverly designed tools that aid the transformation of raw foodstuffswhether fresh flesh or packaged Pop-Tartsinto culinary delights. Indeed, the modern kitchen is salted with all manner of gadgets that cut and join, shred and blend, denude and dress, separate and compress, baste and dry, and on and on. The modern kitchen is, if anything, even more of a workshop than the Peg-Board-lined DIY station in the garage. If the kitchen was an exclusively female preserve, its proliferation of specialized hand tools and its electrical appliances plugged into the most intricately wired spot in the home replicated the factories that womenwho stepped in to man assembly lines while the men went off to warwere leaving to make room for returning veterans. In other words, the postwar kitchen helped to realign female labor within the home in ways not only conditioned by industry but actually experienced by women in the workplace. When Rosie finished assembling a fuselage, she put down her rivet gun and picked up a pastry bag to discharge floral dollops onto dessert for her returning flyer. In this sense, the kitchen is one of many institutions that manage the character and distribution of human energy in accordance with cultural beliefs regarding the appropriate spheres for various kinds of work. In “Counter Space,” the end to which all these tools are put is eclipsed by the exhibition’s final section, which considers ways that visual artistsfrom Andy Warhol and William Eggleston to Martha Rosler and Cindy Shermanhave taken up kitchen matters such as gender, economy, and material culture, leaving one to wonder to what extent culinary art changed as equipment in the kitchen was updated and, surely as influential, as food supplies and ideas of nutrition evolved. The most famous kitchen in Los Angeles in 1929, for example, belonged to Dr. Philip Lovell, a naturopath who wrote articles on clean living and advocated the consumption of unprocessed foods, especially raw vegetables, like those he prepared in a laboratory of a kitchen in his new modern house, designed by Austrian émigré architect Richard Neutra. It was at that precise moment, also in California, that Edward Weston (whose work Lovell collected) began photographing fruit and vegetables, including what surely became the most famous vegetable of the time, a green pepper rendered in black and white. (Pepper No. 30, 1930, isn’t included in the MoMA show, but Weston’s Eggs and Slicer, of the same year, is.) The coincidence, if no more than that, is suggestive: How do representative meals resonate with the kitchens that produced them? No postwar suburban American kitchen bears any visual resemblance to a cheddar-choked chicken-broccoli casserole, of course. But perhaps a slab of this period entrée would reveal in its cross section something of the stages of its making: the freezer figured in the softness of the broccoli; days in plastic wrap recounted by the featureless flavor of the chicken; the new highways to Wisconsin vivid in the flows of melted mild cheese; all settling in a pond of mushroom soup freshly poured from a can of Campbell’s pulled from the pantry. Like hot flesh on a bone, charred over an open, smoking fire, our favorite meals, from comfort food to haute cuisine, bear traces of the spaces through which they pass on their way to satisfy our bottomless hunger for pleasure. Sandy Isenstadt teaches the history of modern architecture at the University of Delaware.